Hello there! Time is flying now to the end of the school term and it’s a very busy time at school! My daughter will be going to secondary school this year so there could be tears on the last day of term – and they’ll probably be mine! She has been at her present school for 9 years (including pre-school), so it’s going to be strange not taking and collecting her from there anymore. I still have my son there for another 2 years though, so I dread to think what I’ll be like when it’s my baby’s leaving year! Anyhow, getting back to these 2 cards that I have for you today 🙂 The one above was made for my Mum and Dad to give to Finley for his birthday in May. 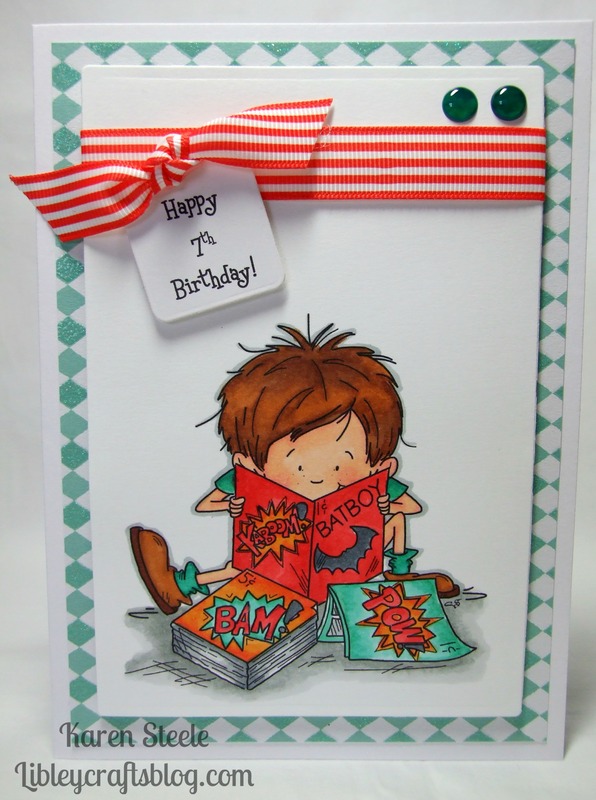 For both cards, I have used this digi from Sassy Cheryl’s Stamps called Gilbert’s MARVELous Adventure. 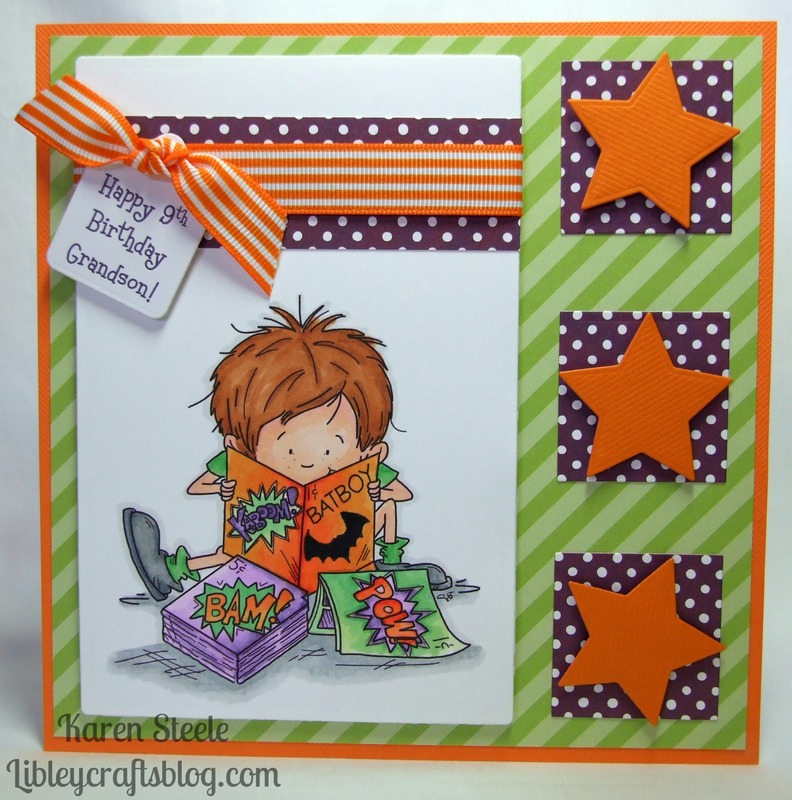 I also used a Kaisercraft Rectangle Die, Spellbinders Star and tag dies, papers by Lawn Fawn – polka in the Meadow and Polka in the Dark, Bazzill orange cardstock, ribbon and Spectrum Noirs to colour. The card below was made for my sister’s children to give to another of their cousins. Here I have used patterned paper by Deco Time, the same rectangle and tag dies as above, ribbon and Papermania Dew Drops. For both cards the sentiments were made on the computer. This image is so much fun!! I love the design – perfect for a little boy! Great cards as always! You manage to make me enjoy colours I don’t usually like! I haven’t tried digikits yet (other than Serif ones) but I like so many of yours that I am considering a purchase or two. What format do you download them in? (Sorry, might be using dinosaur terms here!) Do you use them in CraftArtist or something else? So ADORABLE, Karen!!! Love the colors you used and he is just too precious!!! Another gorgeous card from your creative and talented hands!!! Both Cards are fabulous, Karen. I love reading and so i love all Images with a reading theme. Awww…these are super duper adorable! Love the images…perfect for any super hero lover!